I broke my 2008 book ban to purchase Peter Carey's new novel, His Illegal Self, which was released on February 5. Normally, I would wait until his stuff came out in soft cover (while I absolutely will not be waiting for David Mitchell's new book to come out in soft cover; my lord, I already have to wait till 2009 for it to come out in hardcover!! ), but I am the creator of the Peter Carey fan club on Facebook and so have to lead the way, so to speak. I'm not really getting to the point here am I? 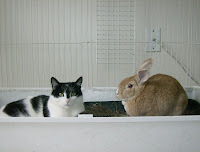 It's because my cat Jeoffry (pictured here with Penny-bunny) is sitting on my lap and purring like the mad purr monkey he is; I keep being distracted by happy thoughts and His Illegal Self doesn't inspire many happy thoughts. Not that it's a bad book; on the contrary, after the first 30 or so pages (which just drag and chafe), it's a very very good book. It's just a grim, kind of painful book which made me feel rather claustrophobic and hopeless a lot of the time I was reading it. I guess it's a sign of Carey's authorial power that I empathized that much with his characters, but it's hard on the head sometimes to be that involved.